The relationship between the European Union and the People’s Republic of China (PRC) is a very significant one. Most people can agree at least on that. It is significant enough to merit almost as many strategic and policy dialogues and ministerial or sub-ministerial level working groups as China has with the United States (over 60).1 It is also significant because the two are the world’s largest trading partners after the United States and China. But as befits a relationship between such different entities in terms of their respective values, political structures, and economic levels, it is also one beset by complexity, sporadic but frequent outbursts of mutual confusion, and sometimes complete cognitive dissonance. There have been times in the past when this has been blamed on Chinese misperceptions of the European Union, or EU misperceptions of China. Chinese policy makers have been accused by Europeans of manipulating divisions within the European Union’s (as of 2016) 28 member states. And the European Union has been accused by Chinese of adopting an imperious, moralizing and, superior tone towards it. What has figured less in the respective literature about the relationship between the two is how much their own self-perceptions often cause problems. With the European Union, it is more that its attitude, often conflicted and complex, about itself has impacted the way it has tried collectively, on behalf of its member states, to deal with China.2 And more often than not, it is China’s perceptions of itself, and its aggrieved attitude towards its own history, much of which involved Europeans as colonizers, that has impacted the way it conceptualizes and understands the European Union today.3 Put bluntly, both the European Union and China are sometimes trapped by images and notions they hold within themselves about their own identity and the ways this frames their attitudes toward each other. The question is not solely about how much, therefore, they understand or misunderstand the other, but in the ways in which they see themselves and their own history, with the limitations this imposes. Since the middle of the 1990s, the European Union and China have needed to work more with each other economically, and this has grown to embracing new areas of governance and security, where the outcomes have become progressively more complex and harder to assess. As this has happened, they have sometimes clashed with each other, with evidence they have grown mutually more disappointed in each other. There are valid questions over whether this disappointment was always inevitable in view of their profoundly different internal natures—one a coalition of states trying to build greater internal political consensus, the other a single sovereign state. Not the least of the erroneous assumptions that each has made about the other is their levels of unity—with them both ascribing levels of cohesion and unity over purpose and decision making that they neither currently have (in the case of China) or can only ever aspire to (for the European Union). The greatest example of their dissonance and clash of expectations was the attempt over 2003 to 2005 by the European Union to lift the arms embargo imposed on China after the 1989 Tiananmen Square massacre.4 The mistake the European Union made over this period was to believe within itself that it would be able to assert an interest with China of which its most important security partner, the United States, did not agree or approve. It attempted to extend the reach of its huge economic cooperation and the importance thereof to China and the world into the realm of security. This illusion of autonomy beyond its recognized core competence as an economic and market actor continued until sharp US rebukes and forceful diplomacy stopped its moves to revoke the embargo. For the Chinese, there was also a misconception. It translated its rising economic importance to the European Union into far greater political prominence—a prominence for which the European Union would be willing to partially sacrifice its relationship with the United States. Both sides were deluded, for different reasons, and in different ways. The European Union believed it had more diplomatic autonomy, and the Chinese that their economic importance had greater scope than it ultimately proved to have. Since 2005, and this first, and most impactful, rude awakening since the announcement of their “comprehensive strategic partnership” in 2003, China and the European Union have managed their relationship in a pragmatic manner. The European Union has had to curb and control some of its ideals about being a model of multilateralism and liberal political values, acknowledging that these have less resonance in China than it once believed. China has had to accept that the European Union will never become a counter balance against the United States and a key player in a multipolar world. Both sides have had to continuously revert to understanding their relationship as primarily economic, despite mutual hopes for something more. Even in the economic realm, however, it has been far from plain sailing. This article asks whether there is any issue on which they can reach harmony of purpose and action. One way to try to answer this is to look at the current architecture of dialogue between the two. The European Union and China run their dialogues and working groups in the second decade of the twenty-first century within a three-pillar framework, which maps out the extant strategic overlap between their interests and, at least, gives some sense of the consensus between the two for where their interests elide and there is need for formal discussion. Some areas are more “shared” than others. All offer examples of the acknowledgement of the possibility of convergence of interests, but they also recognize divisions and difference. • Pillar One: Political Dialogue. This is conducted under the High Level Strategic Dialogue, led on the Chinese side by the premier, and on the EU side by the high representative for foreign affairs and security policy. There are currently 10 separate dialogues or meetings under this pillar, covering issues from human rights to non-proliferation to cyber security and regional issues like Latin America, Central Asia and Africa. It is sensible enough, at least on the surface, that there should be a security dimension in the discussions between the two. The European Union collectively has higher defense expenditures than China, coming in at over EUR 203 billion (USD 231 billion) in 2015.5 But this is spread across 28 members. However, internal EU issues intervene here. Two decades on from the Maastricht Treaty of 1993 and the creation of the European Union proper, with its associated Common Foreign Security Policy pillar, defining a supposedly coherent, shared notion of security even among EU states has proved hard—witness the divisions over the 2003 invasion of Iraq. For the European Union to speak on security issues, particularly in Asia, has proved challenging. It seeks relevance when it does this that most others do not take seriously. The European Union was not, for instance, a part of the Six-Party Talks on the issue of North Korea. Nor does it have a meaningful military presence in the Asian region that might register beside the US one. Its security role on issues like the South and East China seas is largely to use diplomatic leverage and some of its soft power assets, and to stand closely beside the United States. The European Union did play a role in mediating the nuclear freeze deal with Iran, in which China also participated. In multilateralism, it has some space to operate. It has worked with China on anti-piracy, anti-terrorism, some areas of military dialogue, and defined issues of small arms control and non-proliferation. But for a player, which on the surface looks so significant, the European Union’s security dialogue with China is underwhelming, and mostly parasitical on the role of others, particular the United States.It does not figure as a major security player in the Asian region nor feature greatly in the minds of Chinese military and security strategists. This inevitably impacts its political role, as in an oft-interrupted dialogue on human rights. Its co-operation with China on non-proliferation and cyber security are somewhat more constructive, if only because in these areas they operate within a consensus the European Union shares with allies, especially the United States. • Pillar Two: Economic and Sectoral Dialogue. For what has been termed the prosperity agenda, the role is much clearer and more tangible for the European Union than in the security realm.This is reflected in the plethora of different meetings and dialogues under this pillar, structured around the High Level Economic and Trade Dialogue. There are 48 separate current strands, including fisheries, policy discussions, labor issues, agriculture, water, migration and tourism. This acknowledges that despite not having a free trade agreement (FTA), the European Union and China, partially through the liberalizing impact of WTO (World Trade Organization) entry by the latter in 2001, enjoy dense investment links, huge trade increases, and one of the most significant transfers of intellectual property. 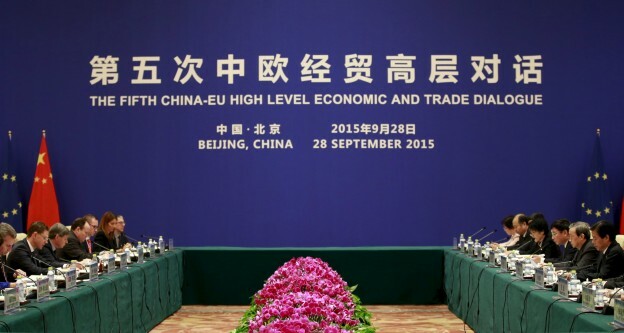 In 2015, China was the European Union’s largest source of imports, amounting to EUR 350 billion (USD 399 billion) and second largest export market, EUR 170 billion (USD 193 billion). 20 percent of the European Union’s imports are from China, and a tenth of its exports go there. The EU-China trading relationship ranks just behind the Sino-US one, therefore, as the largest in the world.6 But it is the dimension of technology transfer where the European Union is unique. It would be fair to say that Chinese economic reforms would not have proceeded as well as they have without the partnership in terms of intellectual property transfer from partners such as Germany’s Volkswagen or Siemens, or pharmaceutical companies like GSK.7 The prosperity pillar has tangible evidence of its importance. As markets, the European Union and China have proved complementary, at least from the 1980s into the 2000s. The question as China enters into what has been called since 2014 the “new normal,” where the composition of its economic growth changes toward less export orientated manufacturing, and more service sector and domestic consumption, is just how far European service providers will be able to gain access to this new type of Chinese domestic market. Another aspect is how much difference Chinese investment will make within Europe, replacing other sources that have been important in the past like Japan or North America. While Chinese foreign direct investment (FDI) in 2014 reached record levels of USD 18 billion, this still constitutes less than one percent of all stocks of FDI in Europe.8 And the composition of this investment is not at the moment in traditional job creation sectors, but largely in real estate, or services. All of this has been achieved, despite the fact that the European Union has yet to confer on China market economy status, largely through its assessment of Chinese protectionism and state subsidies of key sectors in the economy. An audit of the work and outcomes of these three pillars of engagement would show in 2016 that while there are tangible outcomes for economics, technology, students, tourism, and some areas of intellectual exchange, at the political and security heart there is clearly less achievement. Is the future path for the European Union and China, therefore, to simply accept what the record of the last two decades has shown them, and to look at a more restricted, confined relationship—one that expresses no ambitions towards the political and security pillar, and which simply focuses on trade and human interaction? This, after all, was precisely where the relationship between the two started, in 1975, when the European Economic Community (EEC), as it was, conferred diplomatic recognition on the People’s Republic under Mao, and codified this in a treaty from 1985, which simply talked of liberalization of tariffs, opening each other’s markets, and strengthening trade links. The grand experiment since 1992 and the creation of the European Union under Maastricht to go for a more comprehensive relationship with China has, in at least one critique, created a distorted, somewhat skewed relationship where complexity, and dense interlinks only overlay what should be simple—that the two relate to each other solely as markets, and that they should not aspire to anything more than this. Of all the bilateral relationships between the current EU members and China, the United Kingdom is often the European exception, and in some ways mirrors China’s own frequent articulation of its own exceptionalism. Britain was among the first to accord diplomatic recognition to the PRC in 1950, only a few months after its founding. This was, however, not a sign of supportive intent for the vast political project on which China was embarking, but a pragmatic calculation in order to preserve UK interests in its colony, Hong Kong. These interests were overwhelmingly commercial. The United Kingdom therefore could be described as a clearly realistic and often self-interested partner working with China. Could the European Union copy some of the UK’s attitude of unglamorous trade focus and pursuit of material self-interest? This question is even more important to consider in view of the potential exit from the European Union after a referendum on continuing membership in June 2016. If the United Kingdom does choose that path, it will be able to pursue an even more unilateralist China policy than it has already. This joint history and the lessons it left have been both a help and a hindrance for the United Kingdom within the European Union. On contentious issues, from human rights to trade negotiations, the United Kingdom has, since admission to the EEC and then the European Union in the 1970s and over the 1980s, been able to conduct these largely vicariously, through EU agents. That has meant the usual antagonism that a former colonizer attracts from Chinese interlocutors sensitive to these issues has been controlled. This does not mean that the United Kingdom has been wholly immune from involving itself in speaking out on human rights and security issues. Depending on who is in power and where their political interests lie, there have been sporadic outbursts of greater activism on the these more complex agendas toward China. So since 1997 and the Hong Kong reversion, while there have been lengthy periods of benign, largely apolitical “engagement,” where the onus has been on speaking bilaterally as much as possible about trade and economic issues that directly benefit the United Kingdom and avoiding the contentious issues, there have also been intense, short periods of unharmonious clashes, sometimes precipitated by residual issues from Hong Kong, sometimes separate from them. The most intense of these recently occurred after July 2012, when Prime Minister David Cameron met with the Dalai Lama, while the latter was accepting a prize in London. This aroused the fury of the Chinese government, putting all ministerial high-level political contact on hold for over a year. Tellingly, it did not seem to have any impact on investment, trade, student, or tourist figures. The political downturn into 2013 seems all the more stark now in view of what transpired between 2014 and 2015. In a series of largely unilateral moves, the United Kingdom puzzled both its EU allies and other allies by, first, joining the Asian Infrastructure Investment Bank (AIIB), initiated by the Chinese, in April 2015, and, then, in October of the same year, hosting President Xi Jinping for a five-day visit, which one Chinese government spokesperson called the start of a “Golden Age” of UK-China relations. At the heart of this was a huge mutual effort on investment and trade development. Of the USD 60 billion in deals signed while Xi was in the United Kingdom, the most striking were ones where Chinese partners expressed interest in infrastructure projects in the United Kingdom, and in the construction with a French partner of a nuclear power station at Hinkley Point. Did this offer any attractions for other EU members in showing that pure mercantilism could triumph over discussion (and frequent disagreement) over complex issues like differences over values, human rights, security, and political aspirations? If the United Kingdom’s intention was to forge a new kind of scaled down, simplified approach by a (current) EU member engaging with China, focusing on tangible issues like trade, investment, and job creation, then its viability and success is, so far, yet to be proved. Of the stock of foreign investment into the United Kingdom, only 0.1 percent is directly from the People’s Republic as of 2015, according to the British Office of National Statistics.12 Only one percent of Chinese FDI stocks come from the UK. Even a tenfold increase in the Chinese outward figure in two years would still mean it was an insignificant number. Chinese investment into the United Kingdom is also unlikely to have created a huge number of jobs, at least so far. And while the United Kingdom has increased its share of Chinese money, in many ways the anomaly, as elsewhere, is that the figure from the world’s second largest economy remains so low, not that it is so high. In order to get notional commitments to investment from China, the United Kingdom expended a good deal of political capital with other allies. The United States, for instance, accused it, according to one report, of “constant accommodation with China.”13 Within the European Union too, major partners like Germany and France were concerned about the United Kingdom’s change of tack. But, perhaps, the most important problem was that it was precisely while the fervor of the eponymous “golden age” was unfolding that China was involved with some of the most worrying issues over Hong Kong. The mysterious disappearance of local bookseller Lee Bo in late 2015 lay behind this, largely because he was a British national. Not the least of the anomalies of his case was that he had no travel documents on him when he went missing, but despite this was able to reappear in China, confessing to a long out-of-date driving conviction, and raising strong suspicions that the real reason behind his detention was the imminent publication by his organization of embarrassing memoirs about Xi Jinping. This was the strongest language used in such reports, with the accusation of a “breach” of the joint declaration proving incendiary in Beijing. Ministry of Foreign Affairs spokesperson Hong Lei issued a predictably irritated and unbending rebuttal: “Hong Kong affairs are China’s domestic affairs,” they stated. “We ask the British side to mind its words and actions and stop interfering in Hong Kong affairs.”15 Ironically, it was the European Union that had to take an active part in issuing demarches and lobbying the Chinese government, because Lee Bo was, with his British citizenship, also a citizen of the European Union. The architecture of dialogues across three pillars—political, economic and sectoral, and people to people—illustrates in a very tangible way the complexity of the interactions between the European Union and China in the fifth decade of their diplomatic relationship. As the case of the United Kingdom shows, however, there is a desire to try to streamline and simplify the relationship and take it back to where it started—one track concentration on market access to each other, exploring mutually beneficial commercial and investment relations, and avoiding the treacherous terrain of security and political commitments.Here, the European Union has so far either delivered disappointment (failure to lift the arms embargo) or rhetoric that cannot be backed up by any meaningful unilateral action (responses to perceived Chinese aggression over the South and East China sea issues since 2010). Even a focus, however, on purely economic links in recent years has proven difficult. Arguments over trade dumping in the late 2000s were replaced in 2012-2013 by fierce disagreements about solar panels and the overproduction of these flooding the European market. In 2015 and into 2016, this issue was superseded by anger within the European Union over steel, with China again accused of flooding the world market, and already badly depressed with goods produced in highly subsidized factories. The net result of this was a clear shift against attempting to grant China market economy status, allowing for yet further tariff reductions. The possibility of such status being granted by the end of 2016 seemed to be receding by mid-year, looking as if it was going to duplicate in the economic realm the Chinese shock and disappointment experienced after the non-lifting of the arms embargo in the political and security realm over a decade before. Are the European Union and China doomed to perpetually frustrate each other, even when they scale their expectations down and simply concentrate on a few core competencies? Is it not a huge pity, too, that such globally important partners cannot aspire to something beyond just buying and selling goods with each other and make more from the potential of their relationship? Perhaps there is one area where they can achieve a sustainable synergy and matter on relatively equal terms to each other, trying to appeal at least to some of the idealism of the past—and that, ironically, is in the arena of sustainability itself. Not that this strand of common interests is very easy to discern from an inspection of the many dialogues and activities under the second pillar mentioned above. There is no overarching sustainability high-level dialogue. Instead, it is wrapped up within a number of other, subsidiary meetings. These are mainly the environment policy dialogue, the sustainable tourism dialogue, the water platform working group, the climate change partnership, and, more peripherally, in areas like urbanization, or development. It is unlikely that this approach alone will quickly solve the complexity and associated misunderstandings that exist between the EU and Chinese actors. Nor will a focus on sustainability and the environment be wholly immune from political and economic arguments. But it starts to give a single, core narrative that can at least help to structure the other areas of activity, one that is based on solid self-interest but also commitment to global goods and visions. It is an area where both are seeking parity, both have no vested interest in seeing the other fail, and both speak a largely shared conceptual language. And it is also an area where, even were the United Kingdom to exit the European Union and other further internal challenges to occur, there would be enough engaged and interested parties to ensure that cooperation continues at an European level even without the European Union. This, at least, is one practical proposal for what might lie at the heart of an EU-China relationship over the coming decades. 1. The full list of current dialogues (2015) is on the European External Action Service (EEAS) website. See European External Action Service, “SUMMIT,” http://eeas.europa.eu/china/docs/eu_china_dialogues_en.pdf (accessed May 8, 2016). 2. On the European Union’s high regard for its security status and diplomatic mission, see Hans Maull, “The EU as a Civilian Power: Aspirations, Potential and Achievement,” in US-China-EU Relations: Managing the New World Order, eds. Robert Ross, Øystein Tunsjø, Zhang Tuosheng (Abingdon, UK: Routledge, 2010), Ch. 2. 3. A self-conceptualization that had been characterized by British academic Christopher Coker as “resentful.” See Christopher Coker, The Improbable War: China, the United States and the Logic of Great Power Conflict (London: Hurst and Company, 2015). 4. For an outline of the arms embargo, the attempts in the European Union to lift it, and the final outcome, see Nicola Casarini, “The International Politics of the Chinese Arms Embargo Issue,” The International Spectator 42, no. 3 (2008): 371-389. 5. Zoe Stanley-Zickman and Katharine Wolf, “European Defence Spending 2015: The Force Awakens,” European Union Institute for Defense Studies, Brief 10, March 2016, 1, http://www.iss.europa.eu/uploads/media/Brief_10_Defence_spending.pdf. 6. Data from the European Commission, “European Union, Trade in Goods with China,” European Commission, April 14, 2016, http://trade.ec.europa.eu/doclib/docs/2006/september/tradoc_113366.pdf. 7. For an in-depth, early study of one sector area, see W. Zhang and R. Taylor, “EU Technology Transfer to China: The Automotive Industry as a Case Study,” Journal of the Asia Pacific Economy 6, no. 2 (2001): 261-274. 8. “China FDI Monitor,” Rhodium Group, 1Q 2015 Update, http://trade.ec.europa.eu/doclib/docs/2015/november/tradoc_153938.pdf. 9. UK Council for International Student Affairs, quoting Higher Educational Statistic Agency data, “International Students in UK HE – International Student Statistics,” March 30, 2016, http://institutions.ukcisa.org.uk//info-for-universities-colleges–schools/policy-research–statistics/research–statistics/international-students-in-uk-he/. 10. Xi Jinping, “Speech by H.E. Xi Jinping President of the People’s Republic of China at the College of Europe” (speech, Bruges, April 1 2014), file:///C:/Documents%20and%20Settings/Kerry%20Brown/My%20Documents/Downloads/speech_by_xi_jinping%20(3).pdf. 11. This is dealt with at some length in Kerry Brown, “Erase and Rewind: Britain’s Relations with China,” Australia China Research Institute, 2015, http://www.australiachinarelations.org/content/erase-and-rewind-britains-relations-china. 12. Office of National Statistics, “How Important Is China to the UK Economy,” June 9, 2015, zhttp://webarchive.nationalarchives.gov.uk/20160105160709/http://www.ons.gov.uk/ons/rel/international-transactions/outward-foreign-affiliates-statistics/how-important-is-china-to-the-uk-economy-/sty-china.html. 13. Geoff Dyer, “US Attacks UK’s ‘Constant Accommodation’ with China,” Financial Times, March 12, 2015, http://www.ft.com/cms/s/0/31c4880a-c8d2-11e4-bc64-00144feab7de.html#axzz484qct4Rv. 14. Government of the United Kingdom, “The Six Monthly Report on Hong Kong, 1st July to 31st December 2015, issued by Her Majesty’s Stationary Office,” https://www.gov.uk/government/uploads/system/uploads/attachment_data/file/500119/Six_Monthly_Report_on_Hong_Kong_-_1_July_to_31_December_2015.pdf, 3. 15. Quoted in “China Criticises Britain for ‘Interfering’ in Case of Missing Hong Kong Booksellers,” The Guardian, February 13, 2016, http://www.theguardian.com/world/2016/feb/13/china-criticises-britain-for-interfering-in-case-of-missing-hong-kong-booksellers. 16. For discussions of EU-China action together on climate change and the environment, see Jorgen Delman and Ole Odgaard, “China’s Green Economy and EU-China Cooperation,” in The EU-China Relationship—European Perspectives: A Manual for Policy Makers, ed. Kerry Brown (London: Imperial College Press, 2015), 23-29; and Robert Ash, Robin Porter, and Tim Summers, “Rebalancing Towards A Sustainable Future: China’s Twelfth Five Year Programme,” in China and the EU in Context: Insights for Business and Investors, ed. Kerry Brown (London: Palgrave, 2014), pp. 81-127.